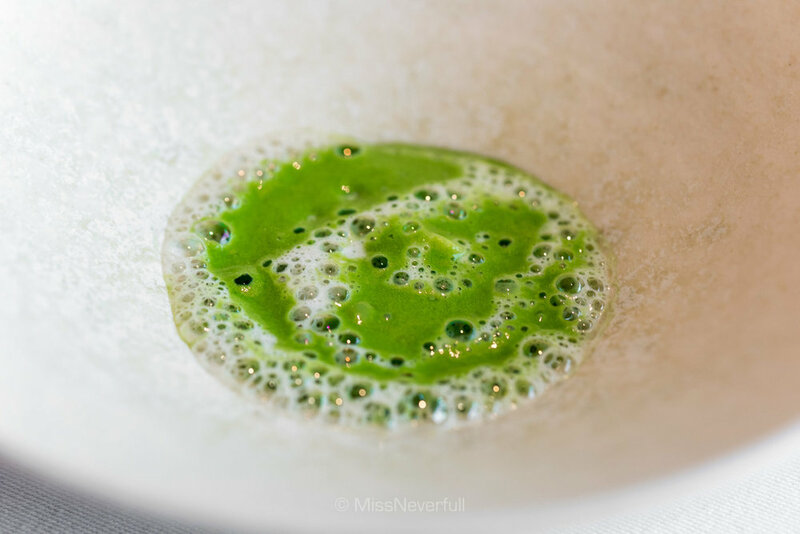 Mentioning Copenhagen is like mentioning restaurant Noma in every foodie's mind. I too agree that Noma has an undeniable influence in Nordic cuisine, but this doesn't mean it is that cup of tea for everyone. 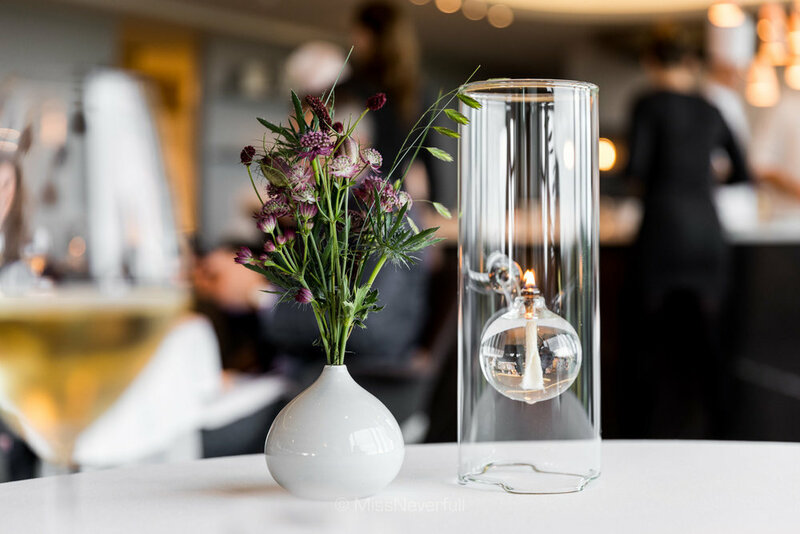 Looking back to my foodie tour to Copenhagen few weeks ago, i visited Relae, Geranium, Studio, Amass, Kadeau, of course Noma as well as its trendy sister restaurant 108 on a Sunday night (most restaurants are closed). All are top-rated restaurants, most with stars, and each has its own strength. Well, it is unfair to compare assorted kinds of apples, but i still want to say: i had one of my best meals so far at Geranium, it was absolutely mind-blowing that even knock off Noma based on my visit. No matter what the World's Best Restaurant awards says (Geranium No.28 vs Noma No.5), no matter what the Michelin Guide says (Geranium 3 stars vs Noma 2 stars), no matter what the other people says - let the food tell. Geranium is the first and the only Michelin 3 star restaurant in Denmark, co-opened by Executive Chef Rasmus Kofoed and sommelier & manager Søren Ledet in 2007. In case you don't know much about Chef Rasmus Kofoed, having been trained at Hotel D’Angleterre in Copenhagen and Scholteshof in Belgium, Kofoed is the so far the most winning chef of Bocuse D'or - the most prestigious gastronomic competition in the world. He is the only triple-award-winner of Bocuse D'or, with the gold, silver, and bronze medals under his belly. In 2012, Geranium got its first Michelin star and a second one in the following year. With Noma have remaining on the two mihcelin star status since 2008, Geranium becomes the first three-star winner in Denmark in 2016. I might be a surprise for Noma, but might not for Geranium. Geranium located on the 8th floor of Telia Parken Stadium, with a awesome view of the Fælledparken Garden, where diners can explore the diversity of the nature along side the dishes. The decor of the restaurant is bright, modern and stylish: clean lines, modern furnitures in a white-and-grey tone, with an experimental open-kitchen which to keep diners' attention. The restaurant also features a lounge area where diners can enjoy a drink while waiting for partners, as well as after-meal desserts. Yes, awarded the Best Champagne and Sparkling Wine List 2016 in Europe by The World of Fine Wine, Geranium possibly offers the best wine list in Copenhagen. Besides wines from famous vineries, Geranium's wine list even covers fine picks of small-scale modish wines from all around the world. Michelin three star is so well deserved. Chef Rasmus Kofoed's diet and cooking are largely influenced by his vegetarian mom and most of his family members. Although Kofoed eats vegetarian with his family, himself is actually not a vegetarian. Kofoed realized that modern people consume too much meat that one's body doesn't necessarily need, therefore Geranium is less focuses on meat but more about vegetables and seafood. 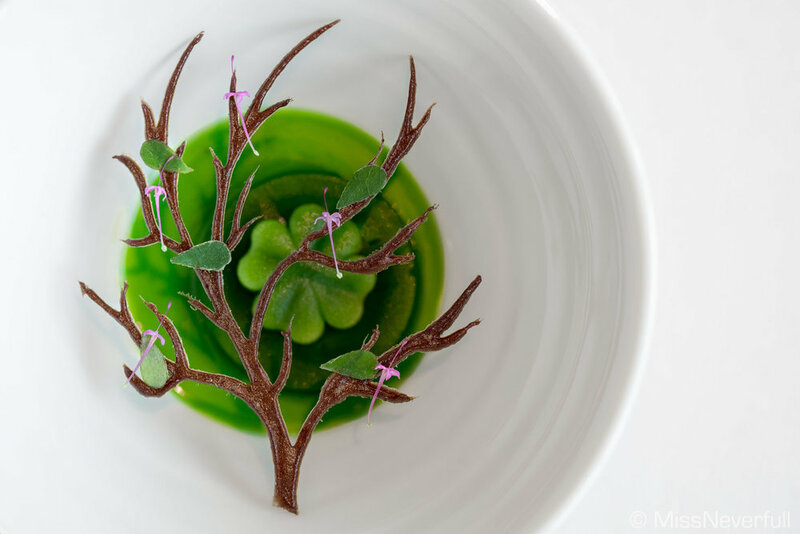 This is quite common in restaurants in Copenhagen but Kofoed definitely is doing it in his own ways - understand the connections between the formative forces and the physical matter of all organisms by serving the best biodynamic ingredients, and to create dining experiences that involve all senses. Restores, challenges and enriches. We had The Autumn Universe menu (2000 DKK) which was the only menu Geranium serves for both lunch and dinner. The entire meal was divided into four parts, featuring 6 appetizers, 7 warm dishes, 3 desserts and 4 sweets with coffee or tea. You can choose your preference of wine pairing (1400 DKK) or juice pairing (700 DKK), wine by bottles and glasses are also available. We both picked juice pairing, with glasses of wine from the wine list. It sounds a long journey ahead but every dish was nearly bite-size, each with natural and light flavors so you don't need to worry about feeling bloating at all. Our lunch lasts for 4+ hours, and we still manage to have a late dinner at 8:30pm at 1*Studio. Ready for the food? Here we go! We started with a small appetizer of Danish lobster topped with a layer of milk made of fermented carrots juice, finished with drops of sea buckthorn oil. A succulent mixture of lobster claw and body which wonderfully complemented with the milky juice. The third appetizer was a small bowl of tomato water, with parsely oils and tomato jelly. This bowl of clean tomato water was surprisingly juicy and refreshing, so spoonful with the aromatic herbs. One of my favourite dishes of the meal was "charred potato" served with some smoked sheep's butter. The potato so perfectly charred - incredibly moist and slightly chewy, such a deliciously surprise. Next dish consists of two parts to eat together. With a green crystalized outerlayer, the 'dillstone' has a soft and smooth texture packing of umami flavors of mackerel fish. On the side was a bowl of granita with horsetadish cream, its light and refreshing tastes harmonized the oceanic mackerel very well. The appetizer part was wrapped up by the creative 'razor clam' - incredibly thin and crispy 'shell' fill with sour cream. Our first warm dish was a delectable tartlet filled of scallops and dried trout flakes, the tart base was nothing but crispy like crackers. 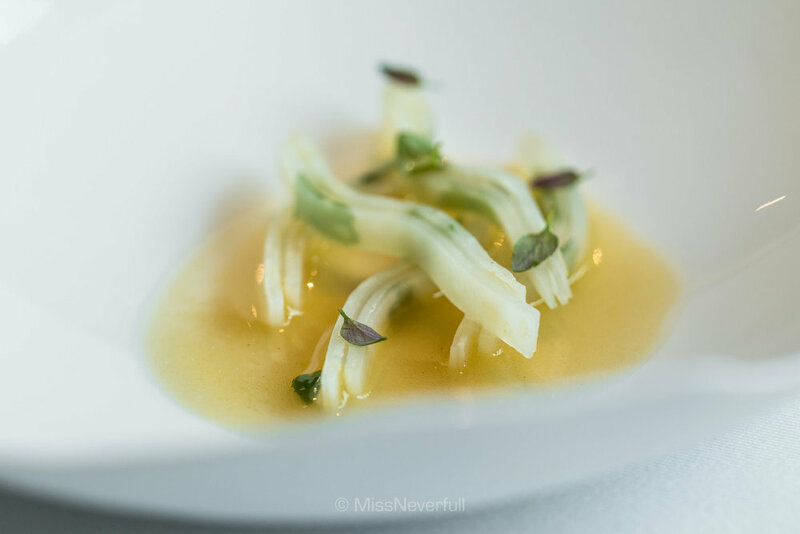 Great textures accompanied by the sandwiched pickled celeriac with lemon verbena leaves, finished with brown butter bouillon infused by scallops. Excellent comination of the land and the sea, simply a real touch of the abundant nature. All the dishes i had so far were fantastic, the signature salted hake was even better. A beautiful dish of marbled salted hake was arrived at the table first, chef then spoon some creamy sauce of buttermilk, parsley stem and Finnish caviar toppings. 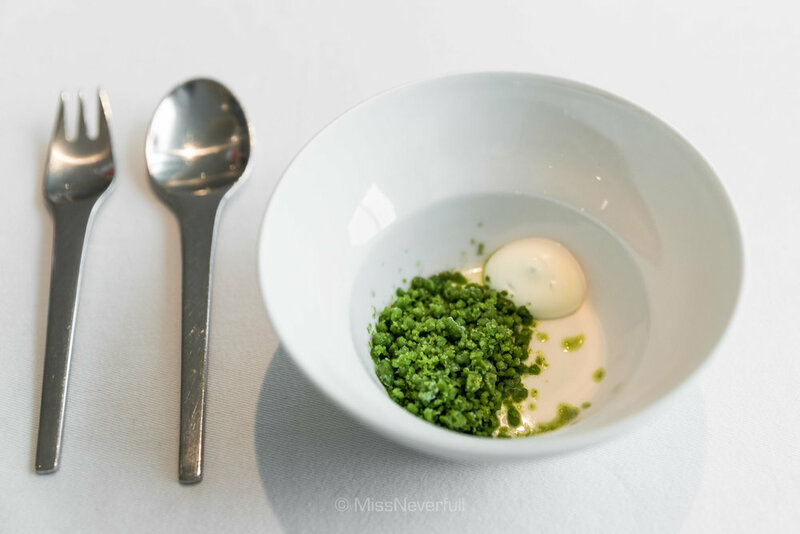 This marvelous dish was packed of deep flavors with caviars to give a wonderful aftertaste, and the cripsy fish scales lifted the texture to another level. Next was a bread course of crispy cheese 'grains', old grain sourdoughs and gluten free sourdoughs with seeds. All the restaurants we visited in Copenhagen serves amazing (healthy) breads, even cafes serves very high quality breads. 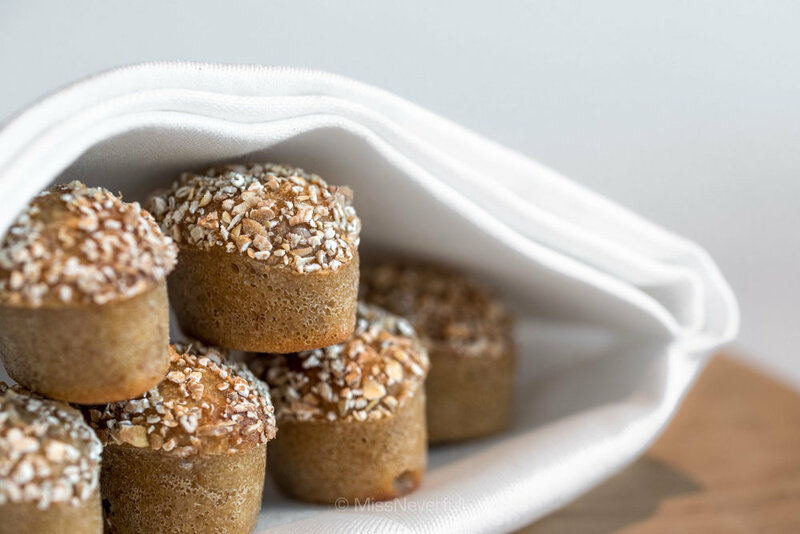 Here at Geranium, breads are also at another higher level. I really loved the cute bite-size breads which won't make the clean white table cloth a mess, and of course, wonderful textures and flavors. I don't mind to be a 'sofa bread' lady if i can eat these everyday. The breads are served with whipped buttermilk seasoned with red sorrel, light and airy, so good with the delicious breads! To continue, we had a creamy vegetable soup made of leek and parsley, inside the soup you can find grilled oysters and some fresh peas. The potato emulsion nicely added more creaminess to the dish. Although the soup was made up of vegetables and a little bit oysters, it tastes extra milky and creamy but quite light. Totally obsessed by the food here. I cannot remember when did a had a satisfying leek dish, but Geranium again did it. The lightly grilled Danish leek was incredibley moist and sweet, with a runny quail's egg yolk to give more luxurious to the dish. This dish is imcomplete without the milky Vesterhavs cheese sauce which was super umami. With a grassy looking, the next main dish was actually chalk full of umaminess. 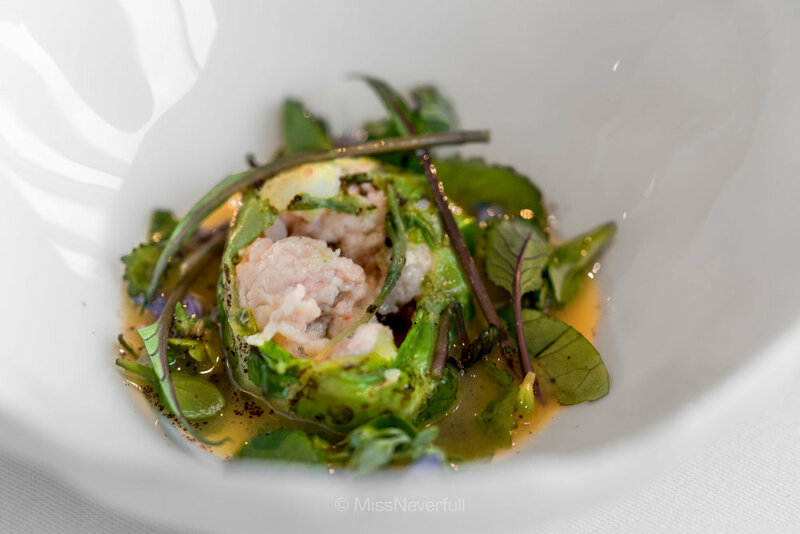 Inside the lightly grilled green cabbage was bouncy king crab meat, surrounded by beautiful beach plants, and a delicious sauce of king crab and söl vinegar. Another lip macking dish that left a sweet aftertaste natural of the king crab. Processing to the last main dish, or the 13th dish of the meal, surprisingly we too girls felt very comfortable of the portions and still have room for more food to be served! My partner had the grilled pork which was salted and cooked on the bone, paired with black currant leaf sauce and pickled pien puree. The pork was no doubt succulent and high in flavors, the pickled garlic on the side excellently balanced the meat. You can never imagine a pork dish to be so beautifully cooked until you had this dish. For me, a no-lamb person, chef prepared slow-cooked monkfish for me. My partner couldn't stop eyeing on my fish when chef was shaving summer truffles to the dish, it was indeed as delightful as it looks. The fish was perfectly cooked and seasoned with mushroom sauce on the top. The bedded assorted mushroom and rye 'porridge' was so delicious even on the edge of truffle. Divine. Our favorite sweet wine for the upcoming sweet time! A lot of thanks to the sommelier and the new father of Geranium, Norbert Dudzinski for introducing and serving all the wines throughout the meal. The first dessert was another bite of pure beauty. Look at this pretty beetroot sphere which has a brilliant thin and crispy outerlayer, inside was filled with sheep's yogurt and rhubarb powder. Very refreshing and delightful. Followed by some creamy beeswax ice cream with a layer of pollen powder on the top. Its deliciously creaminess accompanied by a floral hint was so enjoyable. The blueberries served along with was infused by floral juices with a drizzle of honey on the top, very fruity and elegant combination that reminds you to appreciate the natural produces. Wood sorrel with woodruff - one of the most pretty desserts i have ever had so far, tastes as good as it looks. Delicately smooth woodruff cream on the bottom with a mild grassy tastes, it left a mouthful of rich textures and light flavors. Frozen wood sorrel added some lovely crispiness to contrast the creamy woodruff. A very solid sweet ending. Look at this holly spread of drinks... The juices are the best among all the restaurants we've been this time. Relae uses more fermented ingredients for their juice, alongside Kadeu which serves juice with a higher acidity; Studio serves the juices in a more interesing way which was similar to mocktails; and Noma deliveries the most mild-taste juices which were pretty nice with the dishes too. It was already 4:30pm when we finished the dessert part. Then we were invited to the lounge area near the entrance to enjoy the last part of the meal, more sweets and coffee time! Here the man Norbert Dudzinski again! This time making drip coffee for us. He also showed us the coffee beans they used. Four coffee sweets to wrapping up a wonderful meal at Geranium, featuring caramel, cake with pumpkin seed oil, chocolate with oats & sea buckthorn, and green egg with pine. Each bite was delectable, especially the cake with pumpkin seed oil which was so moist and delicious! Most petit fours i had so far at fine dining restaurants were waste of calories, although i always finished everything to complete a meal, i had never request for more petit fours except this time. My thoughts? Quite obvious. This is one of the best meals i have had so far, and honestly, the best meal i had in Copenhagen this time. At least based on this trip, i think there is more to Copenhagen than Noma, and Geranium is definitely not an 'alternative choice' of Noma. I will definitely march to Copenhagen again for Geranium!